Columbine comes with its beauty color of purple, blue, or pink. This flower has much pollen. However, no need to worry because the bird and insect will take them into flipped back spurs. So, you will be save from nausea. With colorful leaves, this flower gives your more than beauty. Feel free to choose as indoor or outdoor plant. Further, don’t forget to give it more water and sunlight to keep it grows well. It is save with no allergy trigger. Have small petals, these flowers look cute and charming. Let them grow on a pot or bloom pretty on the ground will dramatically change your garden feature. Moreover, they will not irritate people with hay fever. 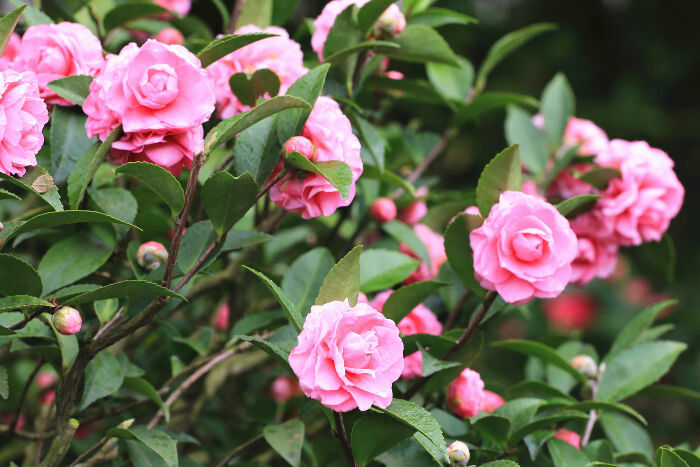 This camellia looks bright with pink color. When you get worse day, this flower will boost your mind. Furthermore, take look some seconds to this flower every morning and get more spirit to do all your schedule. Let your garden more inviting with this tropical plant. Though don’t have any leaves, but this plant gives you beautiful flower. No need to worry, because the pollen brought out by birds or insect. So, you will not get allergy. Bougainvillea produces little pollen. However, it has beautiful color such as pink, white, yellow, purple, and more. Some people plant it in front of their house or let it grows beautifully on the hedge. This flower is actually able to grow well even with little water and sunlight. All types of begonia are good for allergy suffer. These flowers only have little pollen that will save everybody from hay fever because of allergy. Let your garden looks more beautiful by planting these eye-grabbing flowers. One of the most beautiful flowers for our garden is azalea. However, you should be come careful because some part of this flower is poisonous. Don’t be too close with this flower to avoid being poisoned.